Breakout Dutch DJ, producer, and multi-instrumentalist San Holo only released his debut full-length, album1, a few months ago, but after a few years of swiftly rising buzz, attention throughout the blogosphere, charting singles, stellar EPs, and a live show informed by a rock and roll background, he’s far from a newcomer at this point. Out on the road in support of his latest, Holo is set to stop at Cannery Ballroom tonight, Nov. 6 (his first show in Music City proper, from what we can tell), to headline along with a slate of fellow genre-bending, electronic rooted performers: New Zealand’s BAYNK, Dutch protege Taska Black, and LA by way of the Netherlands indie pop up and comer The Nicholas. Even if you’re not dialed into the EDM world, this lineup is a great jumping off point, and tickets are still available right here! Read on for more about the show. 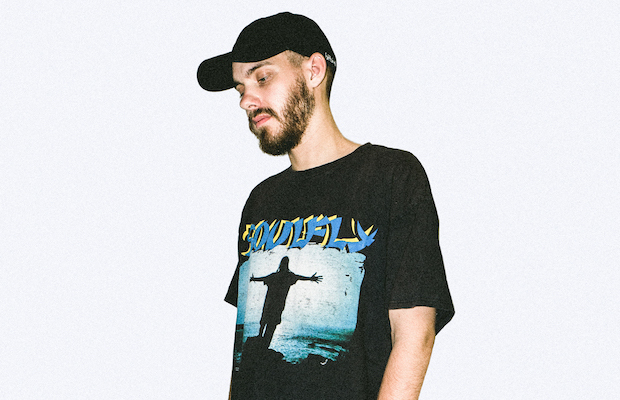 Born Sander van Dijck and hailing from the Netherlands, producer and DJ San Holo came into music through an early love of guitar rock and punk. Though he initially intended to play in bands, after attending the Codarts University for the Arts, and absorbing production skills and a desire for independence and self-sufficiency, San began developing his genre bending EDM, attracting an early following online after initially ghostwriting for other DJs then opting to go solo, before signing with Heroic Recordings and releasing his debut EP, Cosmos, in 2014. A remix of Dr. Dre’s “The Next Episode,” as part of his ’90s and ’00s hip hop remix series Don’t Touch the Classics, propelled Holo to broader recognition, attracting millions of plays, and 2016 single “Light” managed to be his first original to achieve widespread attention. After a string of additional EPs and the founding of his own indie EDM label, bitbird, San Holo released his first full-length, album1, earlier this year, and as his global appeal and increasingly high-profile touring continues, San will bring his refined, engaging live show to Nashville for the first time this fall! Another exciting up and comer in the EDM space, BAYNK, born Jock Nowell-Usticke, hails from New Zealand, and, like San Holo, kind of fell into the full time musician thing by accident. Originally on track to become a chemical engineer (he finished school a couple years ago), BAYNK uploaded his first single, “Sundae,” to SoundCloud, eventually catching the ear of online tastemakers who helped spread his name around, and the promoter of his hometown St. Jerome’s Laneway Festival, where he was booked for his first-ever live performance. Just a few years later, and BAYNK has become an exciting breakout fixture in the electronic scene, bringing a poppy, layered flair and ear for moody, catchy hooks to single after single, lighting up the blogosphere and growing his fanbase. Despite a busy tour schedule stateside, this seems to be BAYNK’s first time in Music City as well. A fellow Dutch DJ with a diverse musical background, rising electronic producer Taska Black was discovered by San Holo through SoundCloud, and signed to his label. Meshing his background in classical music with bass music styles, Black approaches his work with a genre-bending sensibility and unique ear and approach for melody, racking up millions of streams and online attention for singles, remixes, and collaborations over the past couple of years. After European dates with San and a Bonnaroo debut earlier this summer, Taska extends his global tour and EDM ascent to Music City for the first time with his mentor. Also hailing from the Netherlands (are you seeing a pattern?) and now LA based, indie pop artist The Nicholas is also a signee of San Holo’s bitbird label, and has released several songs the producer has helmed. While his sound certainly hovers around the same band meets textured electronic realm as the rest of the bill, The Nicholas adopts a more breezy, poppy, and electro-infused sound, less DJ and more indie artist with an electronic bent. His stuff is really hypnotizing and has us eager to keep an eye on this up and comers; be sure to show up early! San Holo, BAYNK, Taska Black, and The Nicholas will perform tonight, Nov. 6 at Cannery Ballroom. The show is 18+, begins at 8 p.m. (doors at 7 p.m.), and tickets are available to purchase for $25.